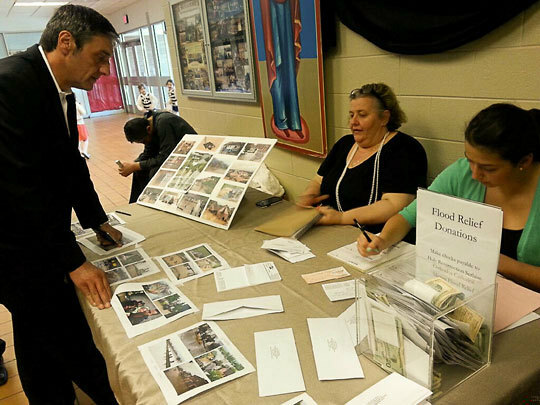 Chicago, IL - Responding to the Church's call for emergency assistance to flood-ravaged areas in Serbia, Republika Srpska and Bosnia & Herzegovina, parishioners at Holy Resurrection Serbian Orthodox Cathedral in Chicago raised $18,000 in a special collection on Sunday, May 18th, with all proceeds going to the Church's relief efforts. "Our clergy and lay leaders are heartened by the outpouring of love and generosity of our parishioners who are once again called upon to assist their brothers and sisters in need as they face the worst natural catastrophe Serbia and Republika Srpska have ever had to cope with," said Fr. Darko Spasojevic, Cathedral dean. "We thank everyone who has contributed or plans to contribute, and we especially call upon our parishioners to intensify their prayers for those who have perished, those who lost loved ones, and those who have lost their homes," he added. Fundraising efforts to alleviate suffering from the catastrophic floods remain ongoing as the scope of devastation is further revealed, and the Cathedral calls upon all people of goodwill to give generously. Monetary contributions are accepted at the Cathedral office daily from 10AM to 4PM, with checks payable to Holy Resurrection Cathedral and "flood relief" in the memo. Experts in geology and water management have called the flooding that has stricken Serbia and Bosnia-Herzegovina a once-in-a-millennium event with rainfall totals normally seen in a 3-month span falling in less than 72 hours, saturating grounds and overflowing into rivers at never before seen levels. For further information, please contact our church office at (773) 693 – 3366.